Does Fel-Pro OS34510T fit your vehicle? OS34510T - Fel-Pro Oil Pan Gaskets is rated 4.8 out of 5 by 6. Rated 5 out of 5 by Marco99 from Best sbc pan gasket I purchased this gasket for my 69 Camaro. I was changing the oil pump with the motor in the car. It fit perfectly, I have no leaks. Highly recommend. Make sure you purchase the longer bolts since the gasket is much thicker. I purchased the kit that included them. Quality product. Rated 5 out of 5 by SBC CJ7 from GREAT KIT 2nd time I have used this kit. Simple, sturdy easy to install. Rated 5 out of 5 by unclbro from Tough & durable Tried several different ones & this is my 1st choice. Rated 4 out of 5 by Jon105 from Well made with excellent supplies,however I bought this filter to fit on 1977 chevy 350 sb. This filter is good quality and very well made and was supposed to fit this car. However, it did not fit because it was too thick and I had to order an similar filter, i.e. 1885 which is almost identical but thinner. Took off one star because it would have been nice if the "thick or thin" issue had been addressed in product description. The "thin" alternate 1885 was great and fit perfectly. Hi, it will work in a Chevy truck 1986 chevy 350 left side dipstick? Yes, this will work in a Chevy truck. 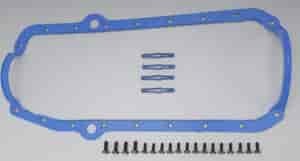 What is the difference between Felpro Gasket # 1881 and # OS34510T? The 1881 is designed for passenger side dipstick motors that use a 2 piece rear main.